In October, I will travel to Italy for a three-week jaunt down the peninsula. 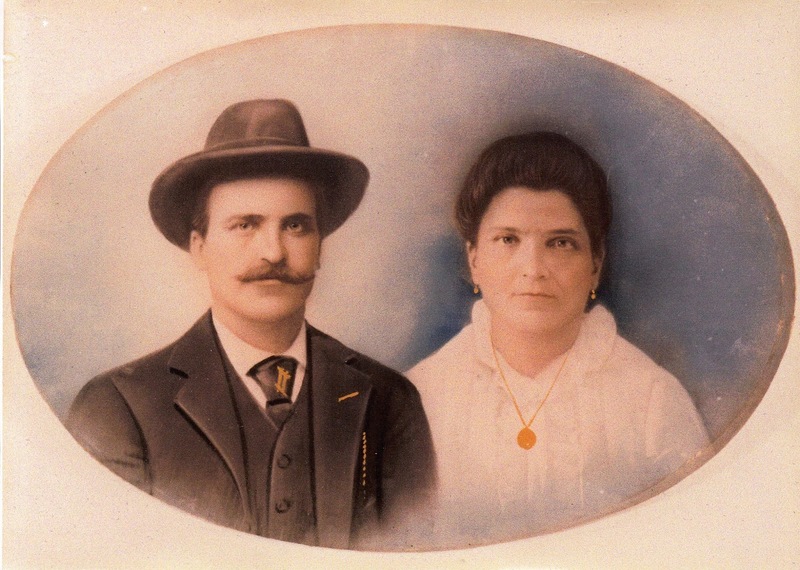 I plan to visit the comune of Potenza where my great-grandmother Ancilla (Ruota or Route) Colacci's parents were born and where their parents died (or at least three of them did). I would like to visit the Potenza cemetery where Ancilla's grandparents are buried. While I'm familiar with the European practice of eventually disinterring the dead to accommodate the newly deceased, there's typically a communal grave where the remains are deposited. I want to visit that site and see where they rest eternally. As I book hotels and map out my itinerary, I still have important research questions to tackle before I leave. For example, how do I locate the particular cemetery where they're buried? Do burial indexes exist? 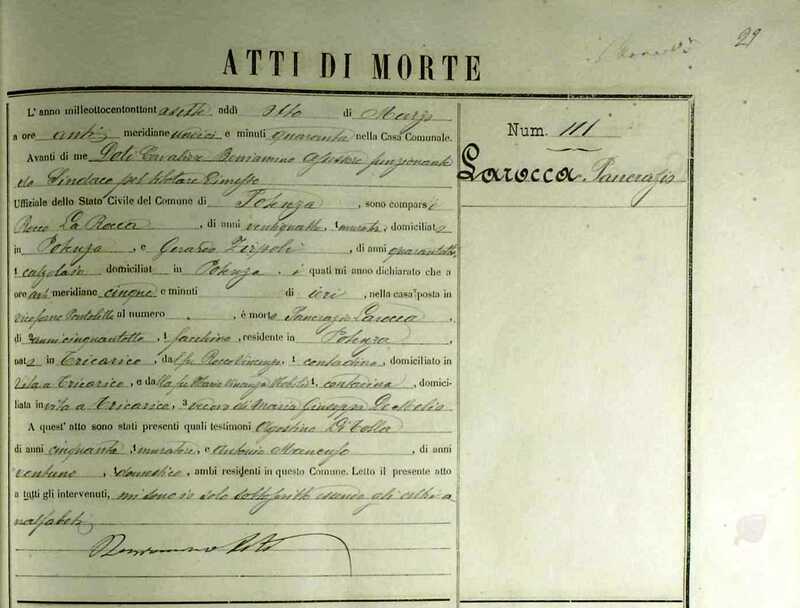 Unfortunately, burial information isn't included on the Italian civil death records. 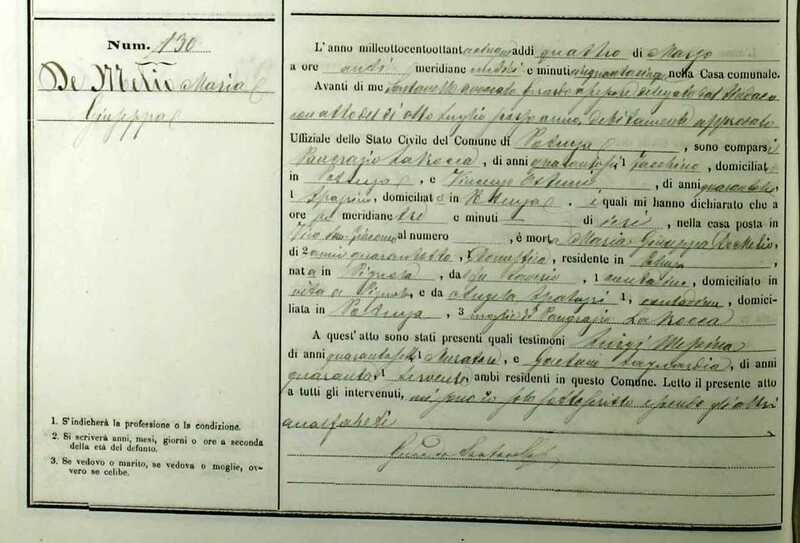 Also, I have death records for three of Ancilla's grandparents confirming they each died in Potenza. However, I'm still looking for the death record for one of them: Ancilla's paternal grandmother Vincenzia (Raimondi) Ruoti. Did she die in Potenza? Is she buried there, too? I need to find that record to determine what happened to her. Ancilla's parents were Giuseppe Route (an Anglicized iteration of the Italian Ruoti) and Maria Filomena La Rocca. They settled in Colorado where they are buried beside each other. 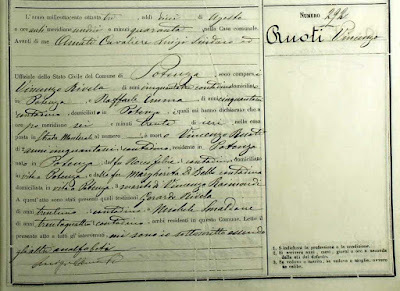 A year ago I wrote about using their marriage records to locate where in Italy they were born, when they immigrated to the United States, and to identify their parents. 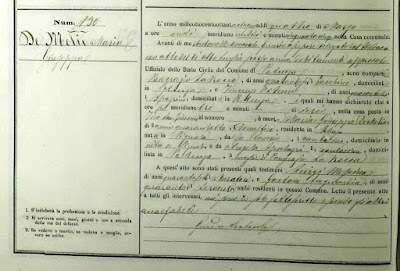 With the help of fantastic researchers on the ItalianGenealogy.com forums, we found death records for Giuseppe's father and Maria Filomena's parents. Those records indicated that they passed away in Potenza. The remaining question about Giuseppe and Maria is when did they arrive in the U.S.? I've still not found an immigration or naturalization record for them. 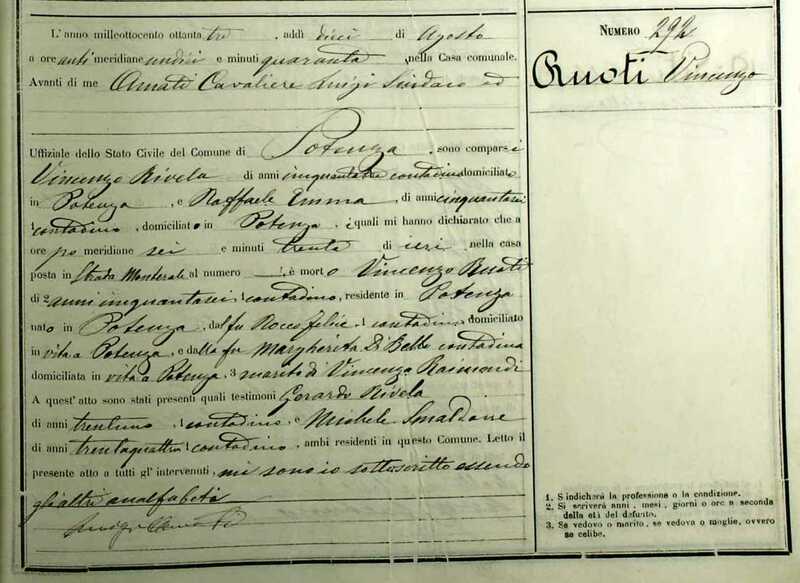 The 1900 and 1910 census suggest Giuseppe arrived in 1880 and 1883 respectively. Maria arrived in 1890 or 1889 according to the 1900 and 1910 censuses. Alas, this is another search (and blog post) entirely. Maria's father was Pancrazio La Rocca. He was born in about 1829 in the comune of Tricarico to parents Rocco Vincenzo La Rocca and Maria Vincenza Mobilio. Pancrazio died in Potenza on March 7, 1887. Maria's mother was Maria Giuseppa De Melio. She was born in about 1837 in the comune of Pignola to parents Saverio De Melio and Angela Spatuzzi. Maria Giuseppa died in Potenza on March 3, 1885. Giuseppe's father was Vincenzo Ruoti. He was born in about 1827 in the comune of Potenza to parents Rocco Felice Ruoti and Margherita D'Bello. Vincenzo died in Potenza on August 9, 1883. 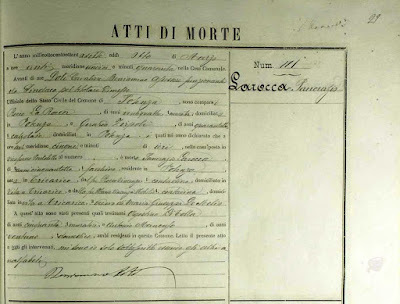 According to Vincenzo's death record, it appears that his wife Vincenzia Raimondi survives him. When and where did she die? My Italian is poor and the script can, at times, be difficult to decipher. Perhaps I've overlooked her name in the indexes. Perhaps she moved away from Potenza and died elsewhere, and I'm not searching records in the correct comune. Her death record was overlooked and not included in the index of names. She had multiple first names and was not indexed under Vincenzia. Although, I've been reviewing the records for any female with a surname of Raimondi. She did in fact pre-decease her husband Vincenzo. The clock is ticking down and the search continues for bisnonna Vincenzia Raimondi. 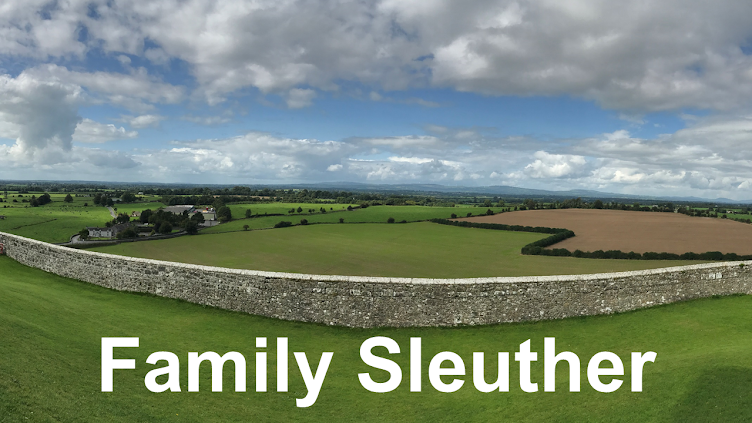 Do you have research tips for locating my bisnonna, or confirming Italian burials? I'd love to hear your thoughts in the comments below. Grazie!